The job of the CNA or the certified nursing assistant can be done better when you have a list of the set of rules, the expected duties, and responsibilities in front of you. The CNA has to be compassionate and patient while working and must be knowledgeable enough about the job. Thus, listing the job in details, which makes for the CAN job description, are suggested here through the detailed Job Description Samples. The nursing home CNA will have a different set of rules and jobs to follow than the CNA of another place. 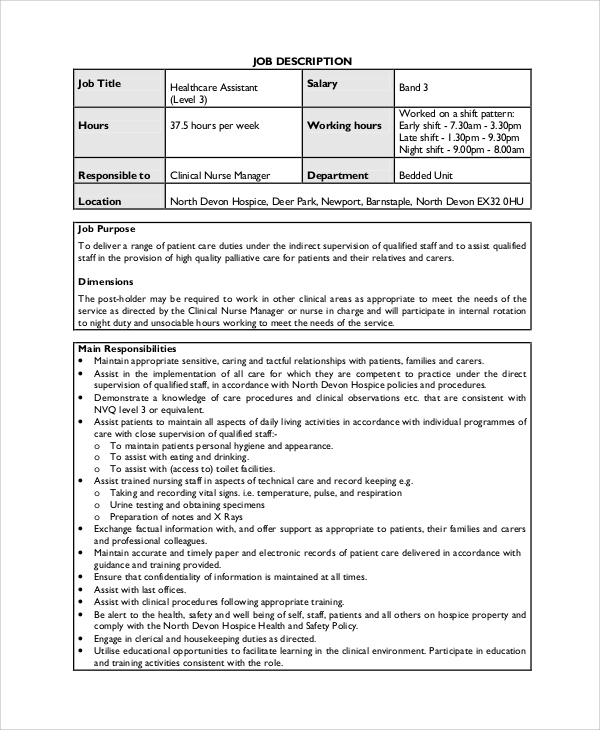 Hence, specifically for nursing homes, this job description is provided for developing an idea of duties. 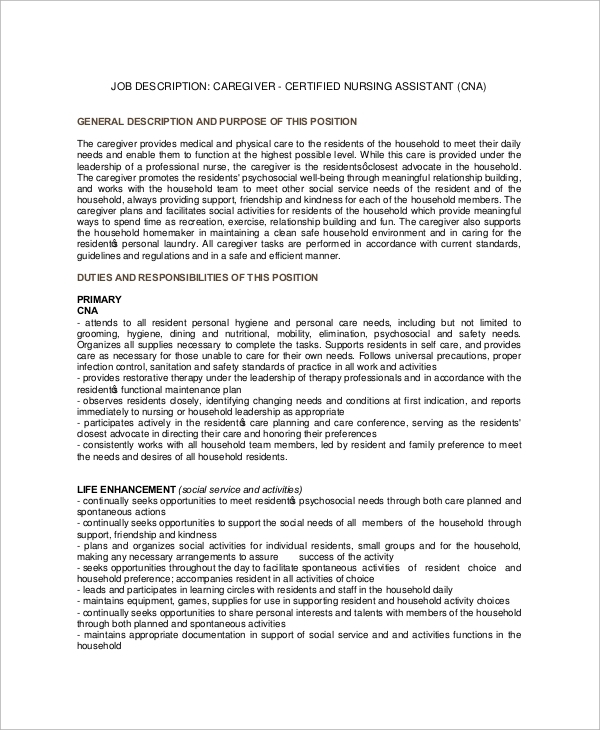 The CNA job description which is specifically for the hospital job is here. The sample tells you the standard set of jobs the CNA needs to perform while being in a hospital. The CNA job description and duties are all about telling in detail about what is to be expected from the CNA. 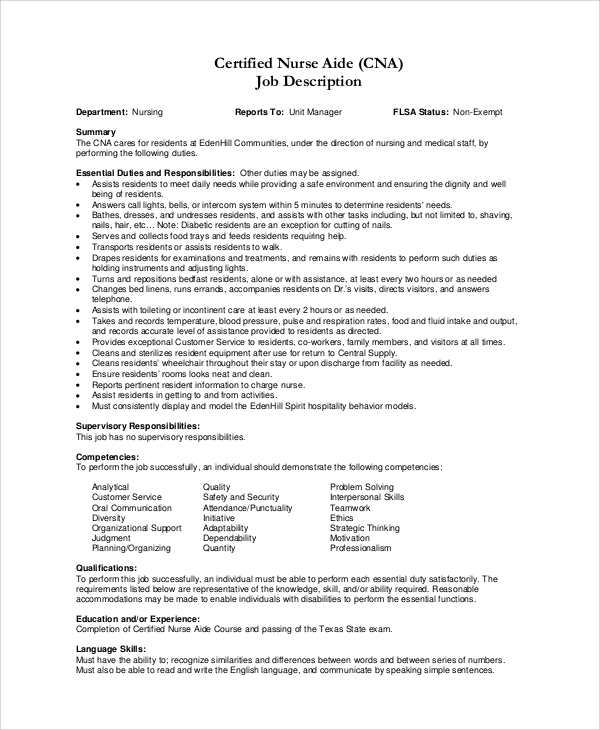 This sample offers ideas for the administrator as well as the CNA. The CNA job has some salary bands, which depends on the place of work, the level of expertise, etc. If you want to tell the CNA in your concern about what their salary should be in different bands and duties, you can try this sample. 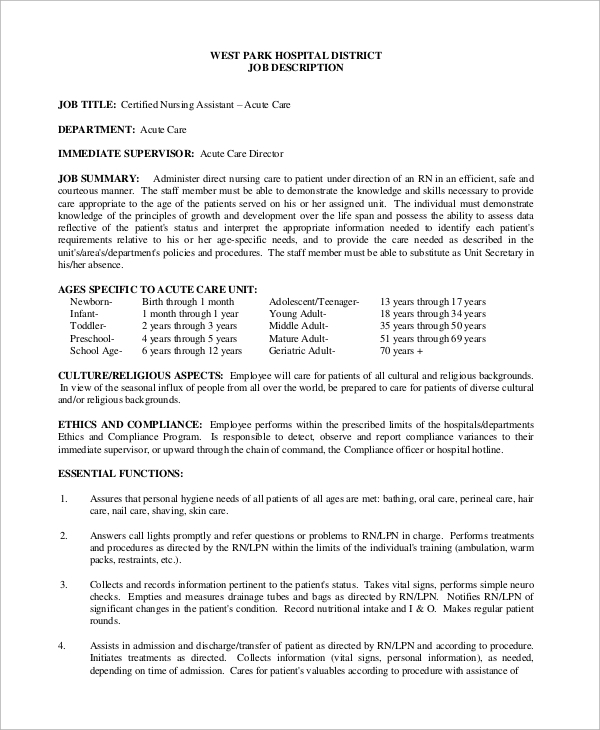 The private duty job description describes what the CNA is supposed to do and follow while being hired privately for a patient outside the clinic or hospital in someone’s home or apartment etc. 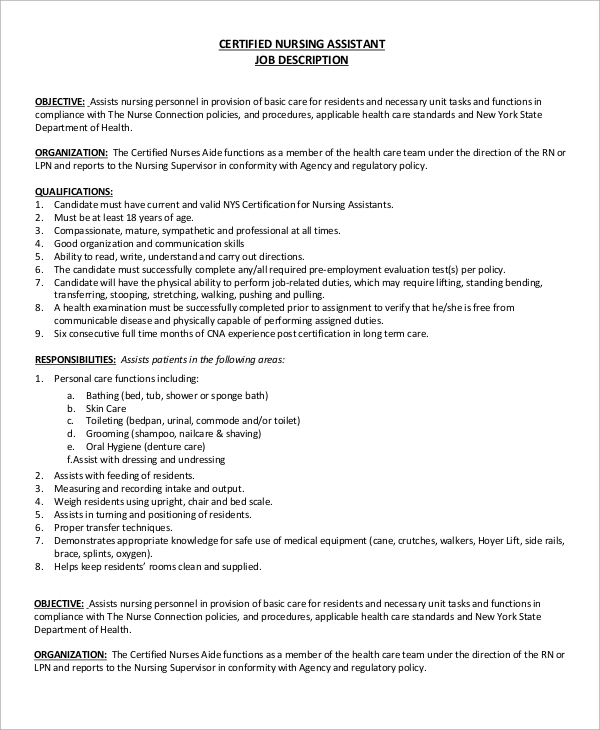 Why A CNA Job Description Is Required? Different candidates pass out nursing from various schools. One may come from abroad or another city. Hence, to see that all of the CNA facility who may have been trained from different sources, while working, gets into a standard set of instructions and follow them without any confusion. That is why, very high importance is given to describing the job for the candidates in detail, and this should be done while keeping in mind the area or premises where the CNA will be working. 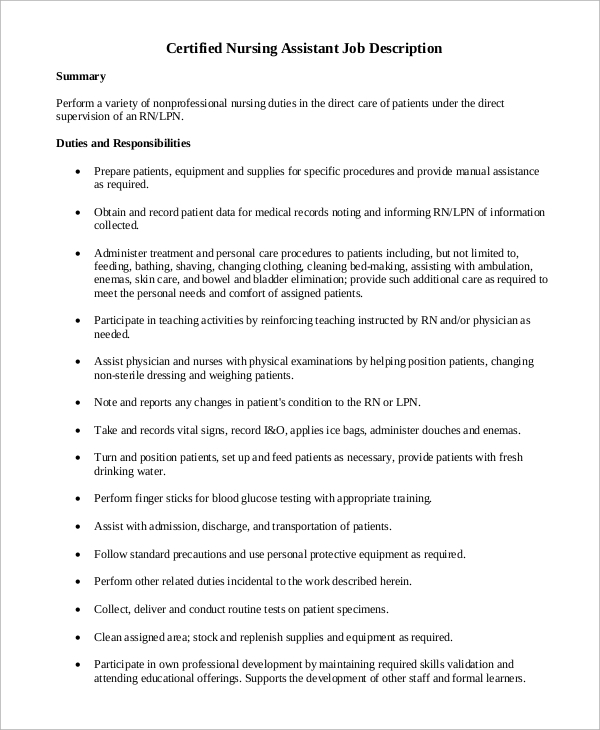 Job description always makes it clear before the CNA and brings on standardization. If you are hiring a CNA for private care, then you may know about what to expect from the CNA, and at which areas you may monitor for work, and pressurize to get the duties done. This is possible only when you know the job description well. Also, when you are on duty to monitor many CNA in a nursing home or hospital, then for your help and also to help them, you may keep the job description in visibility. 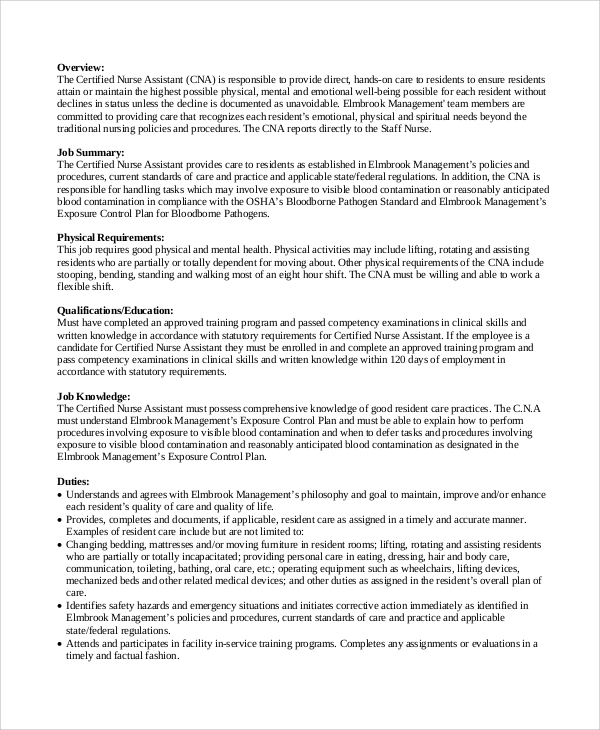 Besides, while training a CNA or while recruiting it a must that you have a Job Description Templates to refer to. 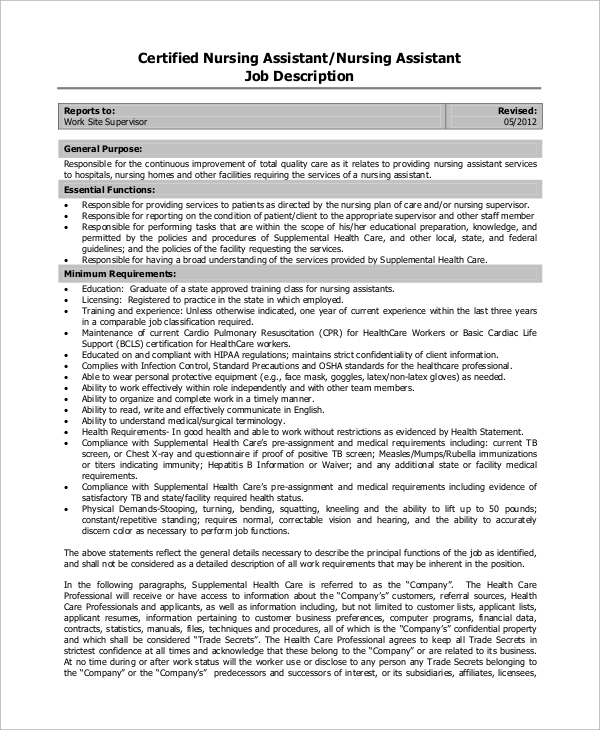 The job description templates and the sample medical assistant job duties, all are available when you look online into the template banks. Hence, you may get an excellent idea of the CNA job duties, and other medical professionals’ job duties by simple searches.